August in the garden, even when not hot and sunny, has a very different palette to the pastels seen at the beginning of summer. I used to have a bed filled with bright pink echinaceas and hot orange rudbeckias, but these prairie lovers have been squeezed out as my garden has matured. I miss my prairie, high summer bed which is now in the shade of a Bramley apple tree. It really is a bit too gloomy, but I have strategically placed large pots of dahlias to give it a lift. 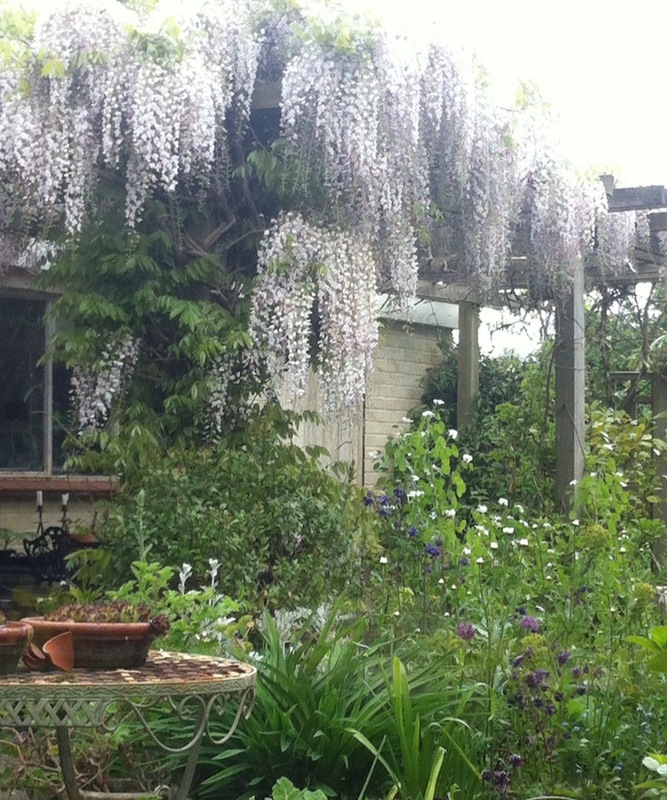 Another part of my garden that has changed significantly is under the pergola. 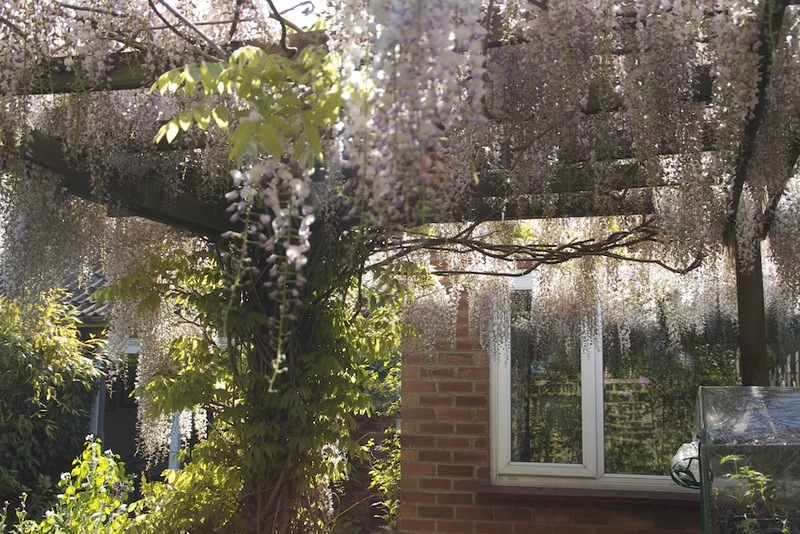 This area is now in fairly deep shade cast by the wisteria and a vigorous grape vine. However, towards the south-facing edge a blue hydrangea and some lily pots have just enough light to bloom, but they most definitely require regular watering. I do love the scent of lilies, but in the end, on a dull August day, the vibrant, visual zing of a bunch of dahlias jolts me into remembering it is high summer after all. 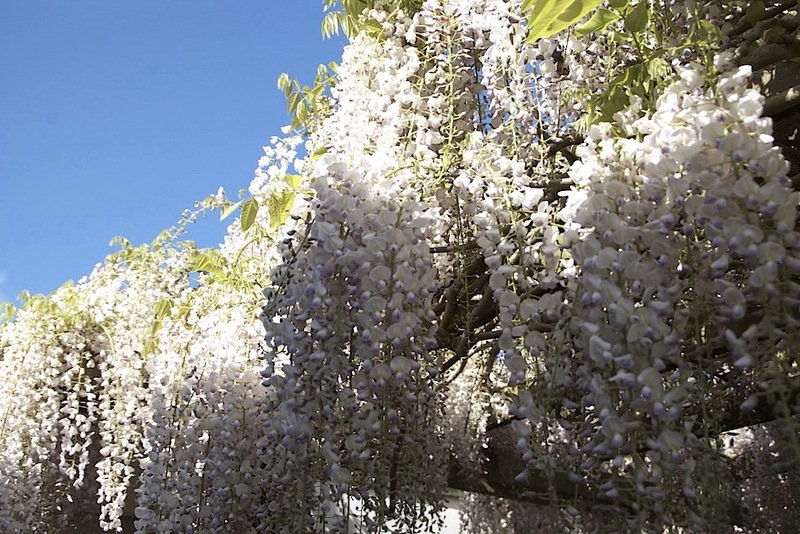 Wisteria floribunda (Japanese wisteria) comes out a little later than the classic mauve Chinese wisteria, but it’s well worth the wait. It also has a rich heady scent particularly noticeable at dusk. 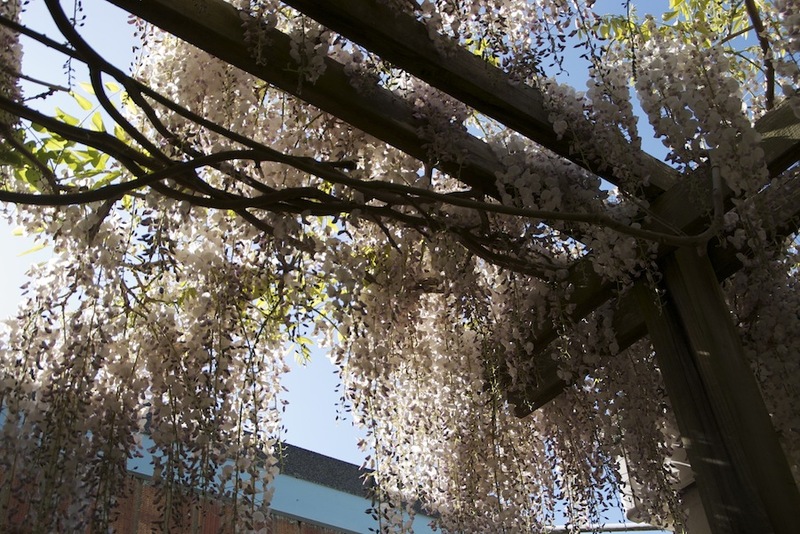 Weather permitting sitting in the dappled shade under the pergola dripping with Wisteria floribunda is a romantic experience. Some of the white racemes are 18 inches long and the whole display is humming with bees. It is a fleeting display though as before the last buds at the bottom of each raceme are open the pea-like flowers at the top are already dropping.